The Phizzing Tub...: How creative.. This has been a long school week since it is the week the kiddos take the state PASS test. I was busy getting dishes put away and getting some items around to make a loaf of soap. Nate was busy playing WOW and did not want to be bothered by his brother. 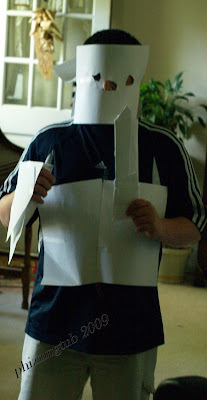 Spencer made a shield, dagger, and armor for his legs/face. I asked what prompted this spurt of creativity and he replied, " boredom."